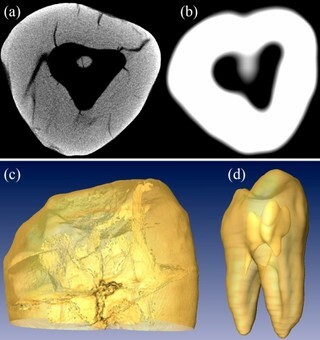 A 200000 years old Neandertaler tooth has been scanned with a micro CT and a clinical CT. To combine high contrast and very high spatial resolution a micro CT must be used. We performed a comparative study of the imaging resolution between the clinical and the micro CT. The differences in image quality are obvious. Micro ruptures as the result of the erosion process cannot be seen with the normal clinical resolution. These ruptures are fissures of sub-millimetre dimension. The contrast of these structures vanishes in clinical CTs whereas these structures can be imaged down to dimensions of 10 µm with the SkyScan micro CT. Only in the three dimensional translucent surface visualization of the micro CT data the fissures can be observed. The tooth has been provided by the Department of Preservation of Archeological Monument in Koblenz.